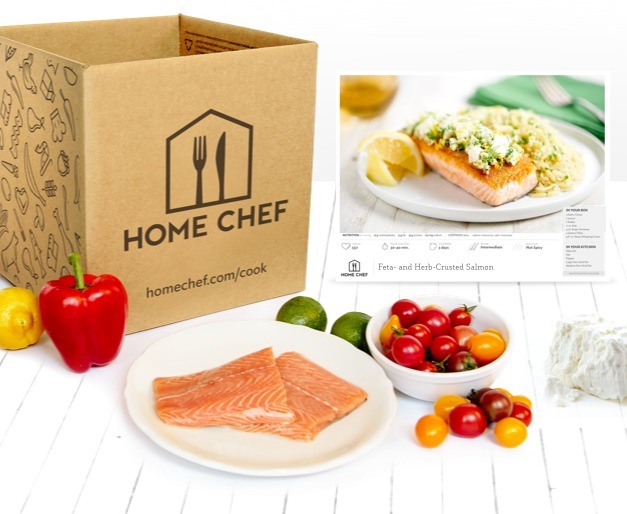 I recently shared with you a $30 off promo code for Home Chef! Today I want to show you first hand how easy it is to prepare fresh delicious meals each week thanks to this particular meal delivery service. 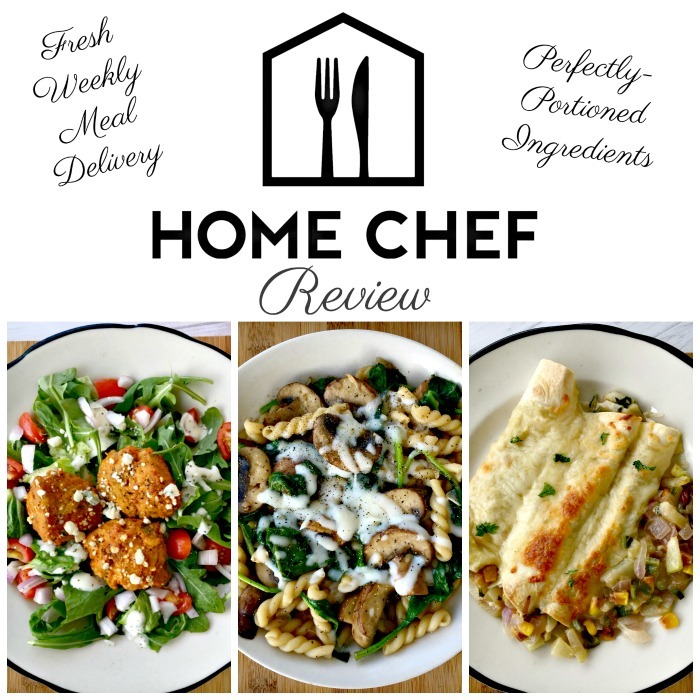 I love that Home Chef delivers perfectly portioned ingredients and easy-to-follow recipes directly to my door. My latest delivery included Buffalo Turkey Meatball Salad with celery and blue cheese, Marsala Mushroom Gemelli Bake with Swiss cheese, and Chayote Squash Enchiladas Verdes with poblano pepper and Chihuahua cheese. Home Cooking Made Easy with HOME CHEF! As a working mom, I don’t always have time on my hands to plan meals each week. So many times I’ve planned many two or three meals, and then become stumped for the others. This is why I love love LOVE meal delivery services, like Home Chef. 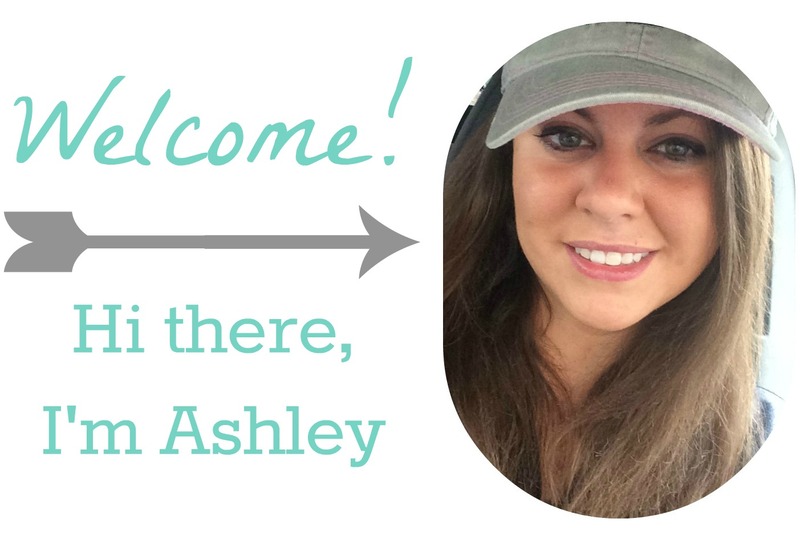 They deliver perfectly portioned ingredients and easy-to-follow recipes directly to your door! Save on Huggies! Grab the coupons to save $2.00 off Huggies Little Movers, or $1.50 off any one package of Huggies! 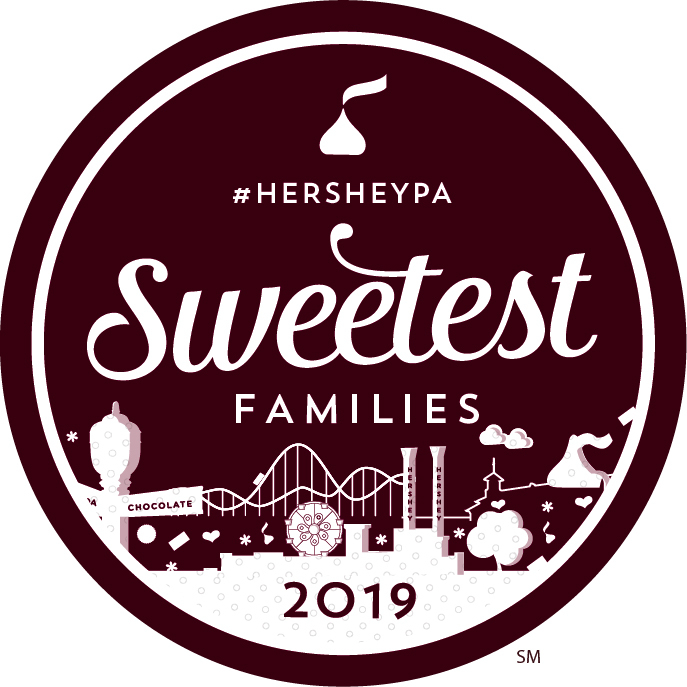 Click one of the banners below to save. 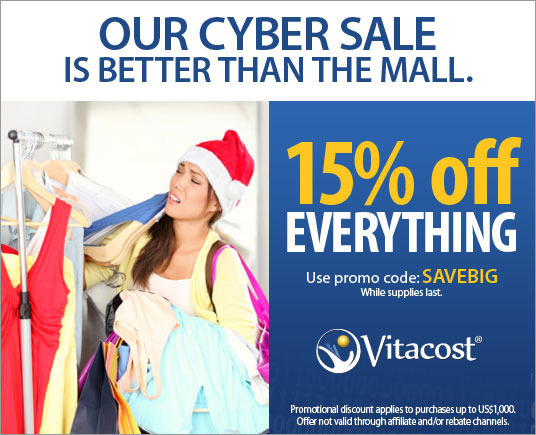 Starting now through November 26 at 11:59 PM EST, Vitacoast is having a HUGE Cyber Sale! Everything, yes everything, is 15% off! 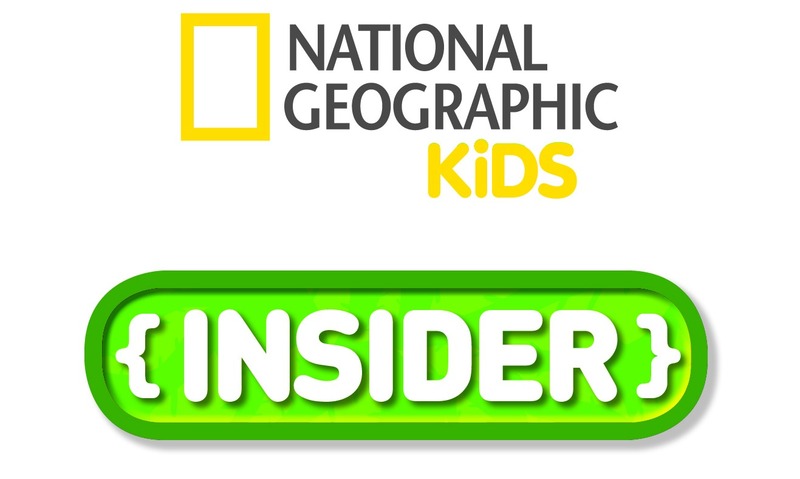 Just make sure you use promotional code SAVEBIG upon checkout. With Vitacost, you won’t find yourself running from store to store trying to figure out who has the lowest prices. While many retailers today sell your favorite health and wellness products are ridiculously high prices, not Vitacost! With their lowest price guarantee, you won’t have to second guess your purchase. They offer over 2,000 of the top, most-trusted natural brands, diet foods and healthy living essentials-the very best nutritional supplements, whole foods and sports nutrition-at discount prices. The items are up to 50% off! If you are a fan of one-stop shopping like me, than you’ll definitely want to take advantage of the sale at Vitacost. It’s great knowing I can stop at one site for my vitamins, holiday dessert mix, skin care products, lip gloss stocking stuffers, diapers, and dog toys! Shipping is quite affordable at $4.99 (flat-rate fee), no matter the size of your package. Additionally, if your order totals $49 or more, Vitacoast will deliver your package right to your door for FREE! Since my son has sensitive skin, we find ourselves often purchasing California Baby brand skin care. Vitacost carries almost every California Baby product you can think of, and at prices lower than my local retailer. I love knowing that I can afford this brand to use often thanks to Vitacost. Just imagine how much lower the prices will be with the extra 15% off! I received complementary products in exchange for this promotional posting. This is 100% my own honest opinion. No one has influenced me otherwise. When we think Black Friday, holiday gift giving immediately comes to mind. How about giving a shelter animal the gift of a forever home? 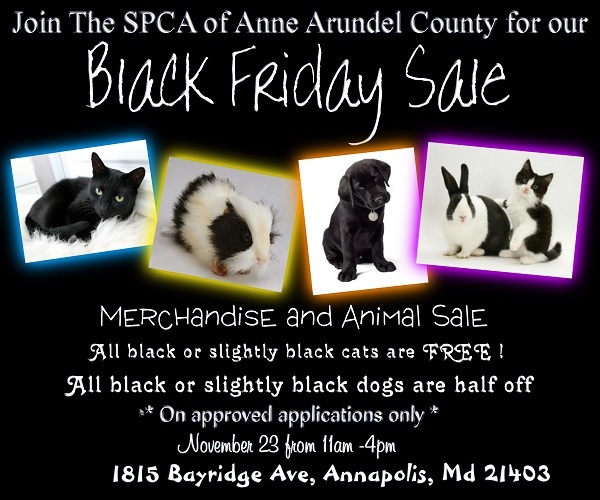 For my locals, in honor of Black Friday, the SPCA of Anne Arundel County (local to Annapolis) is holding their own “Black Friday Sale”. Friday, November 23rd, the adoption fee will be waived on all black or slightly black cats! Yes, with an approved application, those cats are FREE (to a good home of course). As for all black and slightly black dogs, the fees are cut in half to $60 for a mixed breed and $80 for a purebred. According to our local newspaper, 15 dogs and more than 70 cats will qualify for the Black Friday event. There are also rabbits who qualify for the “sale.” All the pets are spayed or neutered, and have had all their shots. They are also tested for illnesses as well. The SPCA is going to be pretty relaxed on what is consider a black marking. The goal is to find these pets wonderful forever homes. The shelter is located at 1815 Bay Ride Ave., Annapolis, MD. They will be open for adoptions on Black Friday from 11 a.m. to 4 p.m. For more information call 410-268-4388. Click HERE to view animals available for adoption on their website.